A few good job interview stories are always helpful and entertaining when preparing for a job interview. They not only drive home a point, but can sometimes make us laugh. After all, putting together your job interview presentation is about as much fun as root canal work. Throughout my Job Interview Wisdom website I have shared numerous true stories and situations to lighten things up a bit. Listed below is an outline of 10 of my favorite stories. You can find several others on my site map. How you dress can pay off - Wearing a suit and tie for a Saturday flight got me bumped to First Class by gate agent. Sweet! 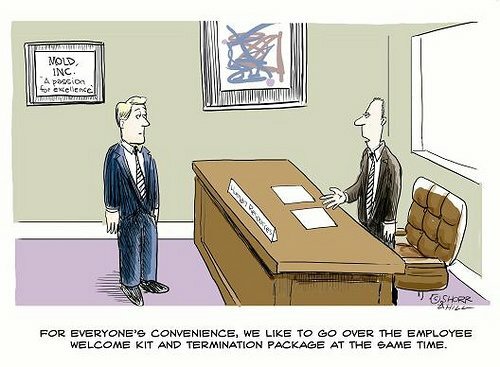 Tale of the Neanderthal Boss - Fired employee does his best to explain his job loss to prospective employers without revealing that his ex-boss behaves like Genghis Khan on a bad hair day. Extracating a chatty co-worker from your office - Jeff comes up with a good strategy to silence Brian, who likes to plunk himself down in your office and talk your ear off. Oh...thank you, Jeff. Case of the stone-faced interviewer - A job seeker debates with himself on whether or not to check one of the interviewer's vital signs during a panel interview to see if he is still alive, in a coma, or just bored with his answers to the job interview questions. The Beverly Hillbilly job seeker - Company's interviewing team learns first hand of Jed's shocking backwoods grooming habits. Anchors Away - Avid boater goes overboard with his hobby, but manages somehow to fit his full time job into his schedule. The jolly hot tub candidate - Hiring manager calls a job seeker to set up an interview and discovers through a voice mail greeting that he is out in his hot tub with his wife...El Buffo. Job seeker annoys executive recruiter because he doesn't return calls. Thankfully, no chastising voice mails were left as recruiter finds out he is in the hospital recovering from a serious motorcycle accident. Amazing receptionist Lori - Genuine love of people and concern for others is felt by all who phone into this company. You won't find another receptionist like Lori. What a gem. Manager's big mistake - Rising star makes huge career blunder that almost derailed her career. Not only did she recover, but she shared the lesson learned with prospective employers.